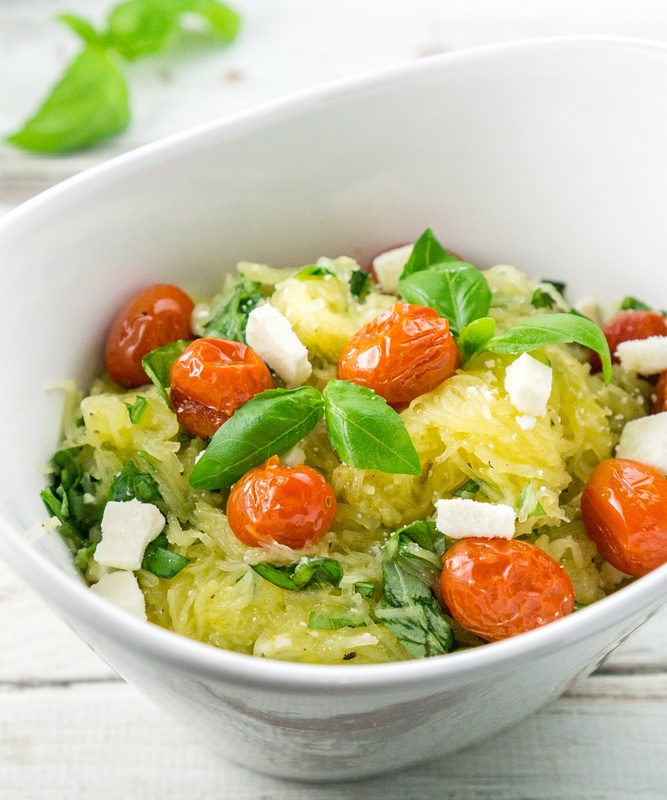 This Tomato Basil Spaghetti Squash recipe is super healthy, easy, and delicious. A great side dish to complement any main course! Preheat oven to 350F. Brush a large baking dish with vegetable oil. Slice the spaghetti squash in half length-wise and scoop out the seeds (for the love of all things delicious, don't throw out the seeds! Clean them and roast them!). Place the spaghetti squash cut side down on the baking dish. Place the grape tomatoes on the baking dish. Bake at 350 for 20-22 minutes, or until the tomatoes start to wrinkle and burst. Carefully remove the tomatoes from the baking dish, and place the butternut squash back in the oven for another 20 minutes, or until the butternut squash can be pierced with a fork. Remove from heat and allow to cool until comfortable to the touch. Use a fork to scoop out the spaghetti squash strands into a large bowl. Add the roasted tomatoes, basil leaves, feta cheese, and salt & pepper to taste. Mix well, and serve immediately.